I have always loved Maker Faire. Unfortunately I’ve never been able to attend anything larger than a Mini-Maker Faire. I’ve also been a fan of Mythbusters since day one. More than Mythbusters I’m a huge fan Adam Savage, the things he does on Tested and all of the education and outreach that he does for science and art. 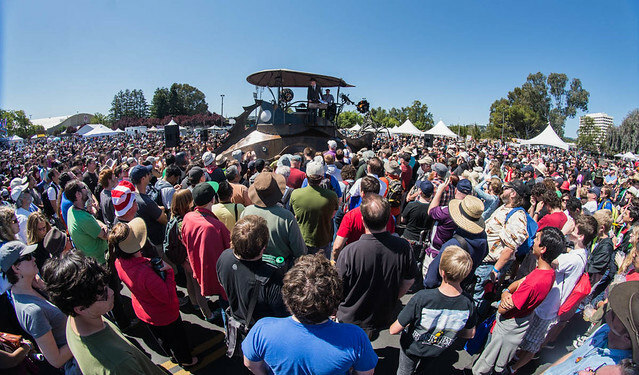 Every year since I first hear about the SF Maker Faire I’ve said “I’m going next year”. After watching this video (and re-watching his presentation from previous years), I am definitely going next year. And I highly encourage everyone to give me a hard time about it next year starting in March, so I have extra incentive to follow through. Below are the notes I took from his speach. You can read them, or just watch the first 15 minutes. Enjoy. Work hard and work smart means many things. When you start to ask questions, like when you start any skill, you aren’t going to be very good at it. It is a skill you need to develop by continually asking for clarification. When you save your employer money and time by asking the right questions they will notice. Ask: Better to be wrong and say something than to be right and keep it to yourself. If you’re going to surf the web at work, hide, please. Mistakes slow you down far more than slowing down does. Your goal shouldn’t just be to finish the thing in front of you, times 50; it means finishing all 50. When I find a finisher I make sure to keep them around as long as I can. Working hard and smart doesn’t require actually being smart. If you lukewarm the performance of your job it doesn’t matter how smart you are, no one will notice. As an employee you might not feel like your supervisors know what you’re doing. If you are working hard and smart they will notice. People who work hard like that are hard to find, inspire everyone around them to work harder, enjoy their work more and enjoy working well with others, save time and money and become invaluable. Some may not notice. Some may not want you to know the big picture; some may tell you to shut up when you ask those questions. Don’t work for those people. This started out as me taking notes on his speech, I thought I was paraphrasing a lot, but looking back a lot of those sentences are direct quotes. I’m not sure which is which. So the parts I took particular care to quote are in italics. My full notes are here but it would be faster to watch the first 15ish minutes of the video than read my notes. Sometime between minutes 15 & 17 he starts answering questions, most of them are good. One of them I felt strongly enough about that I quote it here with a portion of the thoughts that went through my head when I first heard it. At first I balked at this a little, but then I realized that aside from how widely “The Scientific Method” is used, I completely agree. My first thought after overcoming my knee jerk reaction, was that the world would be a better place if more artists understood the scientific method. Then I realized the world would be a better place if all people understood the scientific method. The same is true of teaching everyone the same creativity that is nurtured in artists.